Year after year many Canadians put their savings into a Guaranteed Investment Certificate as their main form of investment. It’s a risk free investment that gives a little bit more money than your standard chequing account at the bank. Truth be told, buying GICs is a terrible investment. They aren’t liquid, the return is paltry, and in real terms after inflation, a GIC is losing you money. Many Canadians are directed to safe assets by financial advisers, such as bonds, GICs, and money market funds. They all make interest payments to you on a monthly or annual basis. They seem simple because that’s all Canadians know and most individuals want to be risk free. One other alternative to receiving regular income is through dividends. Dividends are payments made by corporations to individuals as part of a way to share in the profits of the company. When companies become more profitable, the larger the dividend becomes. Dividend payments are based on the share price of the company, but not all companies participate in giving a dividend to their investors. Yields may vary and most companies that do provide a dividend will range between 2-5%, but it’s not uncommon to find some companies that pay over 10%. The real focus of this post is not to describe what makes a good dividend company, how to choose that company, but an explanation of why payments from dividends from corporations are more advantageous than interest that you receive from GICs, money market funds or bonds. The simple answer to this is taxes. It’s tax season for most Canadians, so this has a big impact on what you might have to back to the government on the investments that you have made during the year. When you collect interest, that income is taxable. The bank will send you a statement indicating how much interest you have received for your investments. The income generated from these sources are fully taxable at your marginal tax rate. After receiving interest of $200, the total tax bill becomes $48.30. That’s a hefty 24.15% of the investment. Dividends are taxed similar to interest income in that the taxes are applied at the marginal income tax rate. The one caveat about dividends is that the money being paid out by the corporation is already taxed. In order to avoid double taxing the income on both corporations and individuals, the government provides individuals receiving dividends with a special a tax credit. In order for the credit to be applied, the income stated from dividends must be calculated to pre-tax levels. This is called grossing-up the dividend value. This value needs to be reported as dividend income in an individual’s tax return. Only after that is calculated, does the dividend tax credit get applied. 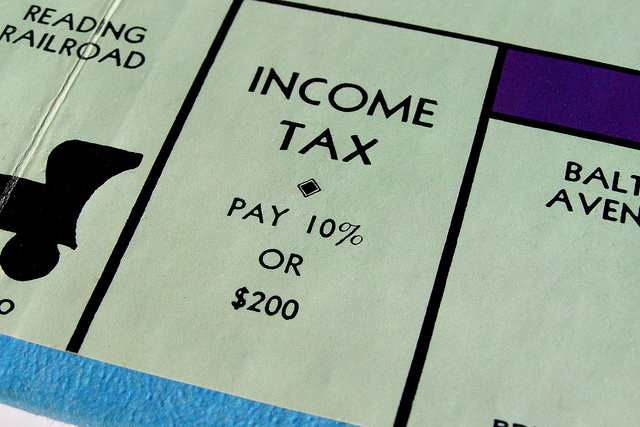 Paying taxes is something you can’t avoid, but it’s something you can minimize. The important point in this example is that not all income is created equal and therefore not all income is taxed exactly the same way. It’s tough for an ordinary Canadian to understand the crazy tax laws that are available in our system, but these laws have an important impact on how and what investments should be made. The example illustrates very well why dividends are much more tax efficient than interest income. The fact that only $7.59 of taxes need to be paid versus $48.30 is a huge difference. This is a 636% difference in the amount of taxes that need to be paid back to the government. Wouldn’t it be more beneficial to keep money in your pocket rather than giving it to the government? This doesn’t mean that 100% of your portfolio should be allocated to dividend paying shares and companies. Remember that diversification is the most important part of a long term successful investment portfolio. Whatever investment portfolio is created, don’t ever discount the fact that dividends is a great way to earn regular income through investments.